Developed by NDS, this guide will assist leadership teams to determine their required business processes for operating in the National Disability Insurance Scheme (NDIS) business environment. The guide covers the whole customer lifecycle. At each stage, there are specific procedure required. Read the Business Process Development Guide for Providers. Developed by NDS in partnership with the Curtin Not-for-Profit Initiative, the aim of the Costing and Pricing Learning Program is to provide a suite of training and support resources for service providers that can be applied to the challenges of a changing funding environment. The tools are geared towards small and medium sized providers. The Program can be found at www.cplp.nds.org.au/learning-program. If you are planning to join or already working in the disability sector, National Disability Practitioners (NDP) is the support network you need. NDP has grown to become a leading association for disability practitioners, with a community of more than 14,000 members. 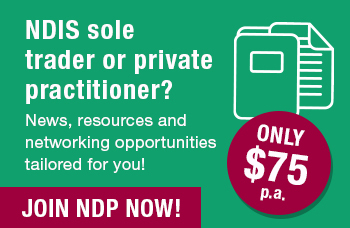 NDP is a one-stop-shop where you can access information, develop your career through our free Learning Hub resources, and make the right connections. Our focus is on supporting you to support others!